I have been working on Irene since 7:30 this morning, so I'm turning in for the night. It has been a very long day. The hurricane will be a major storm in North Carolina, so I hope coastal residents are boarding up and getting out. A few minutes ago, I received a Tweet from a woman who told me she is "freaking out" about Irene (she lives in the area it is forecast to affect). I am also hearing from people getting ready to evacuate as well as those staying home. If this is your first hurricane, you might be feeling slightly silly in case the whole thing is a "false alarm" but you think evacuation is the right thing. Or, you're in the path of the storm but not in an evacuation area so you purchase essentials (see posting below) so you can hunker down. Or, you are just anxious about what the storm will bring. As you purchase supplies, think about one more purchase that just might give you a little peace of mind. 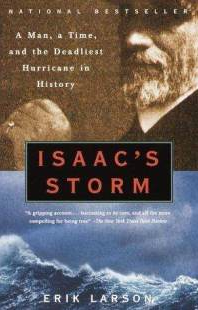 Isaac's Storm by Erik Larson. It is the story of the Galveston Hurricane of 1900 that killed 8,000 people which would easily happen with Irene if there were no warnings. It is an excellent book that I used to help determine the style of writing I used in Warnings. It has a 4-star rating at Amazon, but I believe it deserves 5-stars. 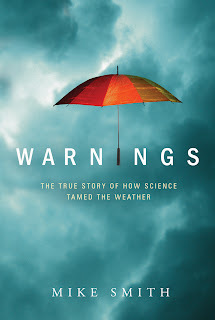 Warnings: The True Story of How Science Tamed the Weather by yours truly. It is the never-before-told story of how the storm warning system -- that is saving lives as you read these words -- came to be. It is very much a people story; and it is a light and uplifting read. You'll learn how the forecasts you are relying on are made and about the dedicated people working night and day, weighing the evidence, and making decisions. It has a 5-star rating at Amazon. Warnings is available in hardcover, Kindle and Nook. Isaac's Storm is available in softcover and audio book. Read either book in this situation. I promise, you won't be sorry. Talk with you in the morning.